Apparently, there is renovation going on, scaffolding is visible above the roof. And now the spire HAS collapsed! Indeed. 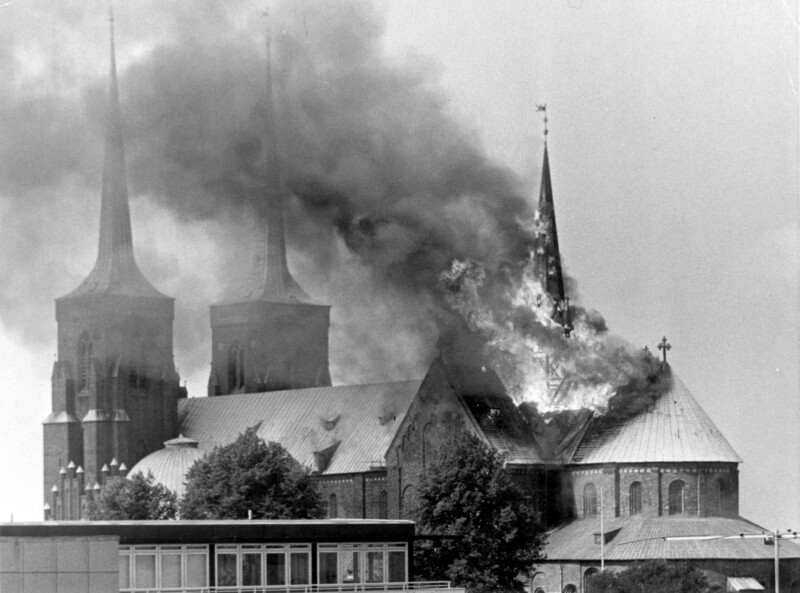 I'm not religious, but I hate to see stuff happen to history like this. The spire still seems to be up, however. ETA: Apparently stale video, they've replayed it collapsing. Last edited by Trebuchet; 15th April 2019 at 10:53 AM. Not before I can visit the thing! But seriously, that Cathedral is a national monument. Dammit! ETA: And as usual, Trump had something stupid to say about it. Last edited by Belz...; 15th April 2019 at 10:55 AM. Oh wow, this is an inferno. Announcer on that CBS feed a few moments ago: "This is a tragedy for all French people, whether they are Christians or Catholic." But seriously, this is very very sad. Tragedies like this always bring out the best in people. Well yeah, but I bet he looked great while he was saying it! ETA: Shame to see damage like this to any historic building. One thing a lot of people don't realize is that in an event like this, the stone it's built from loses its structural integrity. This is really bad. Notre Dame is the top tourist attraction in France. You can hardly get any more prominent. Notre Dame is literally the center of France - distances to other places are measured from a stone right in front of the church's main portal. The original spire was constructed in the 13th century, probably between 1220 and 1230. It was battered, weakened and bent by the wind over five centuries, and finally was removed in 1786. During the 19th century restoration, Eugène Viollet-le-Duc decided to recreate it, making a new version of oak covered with lead. The spire that was just destroyed at least isn't that ancient, and it burned so vigorously because it was made of wood, not stone. Yep. Looking at the current vids from the site it does not look like there will be too much salvageable. Lots of valuable artwork will be lost along with the iconic building. Currently reporting no deaths or injuries. That is good news. it's a very strange feeling when something that has existed through the ages gets destroyed before your eyes. Most of the flammable material is in the roof, heat rises, so it is not clear to mee that TOO much of the stone structure will deteriorate due to heat. But of course the roof is important to the structural integrity, or so I'd assume. The roof appears to be mostly or entirely gone. Has anyone ever read Victor Hugo's novel "Notre Dame de Paris" (as opposed to watching a "Hunchback of Notre Dame" movie)? It is essentially a big love letter to gothic architecture, and the value of preserving historic monuments. I read a translation many (like 30?) years ago - one of the most memorable books I ever read. I still feel Hugo's passion. It hurts today. Too soon for any of you to jump to conclusions about the state of the stone and so on. Trust me on this. It certainly looks worse than York Minster, which was at least contains to one transept. A sad day indeed. I get your point, but "through the ages" is a bit misleading. It's only been about 900 years since construction started. Not much older than Oxford University, or Tenochtitlan. I hope they will manage to save as much as possible. But still, a staggering amount of irreplaceable history is going up in flames as we watch. On CBSN, they are saying that the roof has collapsed completely, and there is now fire everywhere inside the church. Difficult to imagine that fire fighters could or would be inside now to attack the blaze. Very depressing. I did. I also visited the place around 30 years ago when I was an insufferable teenager. I thought it was overrated. As sad as it is to see this historical monument suffer, my advice to Micron is that he shouldn't try to use it to stop what is planned for May 1st (making him eat cake). I get your point, but "through the ages" is a bit misleading. It's only been about 900 years since construction started. So only the middle ages, the renaissance, the age of discovery, the age of enlightenment, the age of revolutions, the victorian age and the modern age. I think those count as "ages", plural. Very sad. Definitely ND is in the top hundred best cathedrals of France. My art history snobbery leads to to suspect many if not most of the foreign bereaved cannot actually name a second cathedral in France. Yes, definitely worse than York Minster.. Although that was bad too. Last edited by Architect; 15th April 2019 at 11:51 AM. Eh. I take a somewhat longer view, I guess. The building's 900 years old, man. Concede the point. I understand what you are saying, but it wouldn't have been a trade. It would just mean that we had lost lives along with the building and contents.